German historian; born at Bernburg Feb. 22, 1793; died at Frankfort-on-the-Main Nov. 22, 1860. Jost was one of a poor family of eleven, most of whom died in infancy; and when his father became blind, the duty of guiding him fell upon Isaac. At the age of ten he lost his father and was taken to Wolfenbüttel; there he attended the Samsonschule, which at that time was conducted in the style of an old-fashioned ḥeder. This condition improved, however, when S. M. Ehrenberg (1807) took charge of the school; under him Jost began to study the German language. An intimate friendship connected him with Zunz, who was also a pupil in that school, and together they prepared themselves for the entrance examination of the gymnasium. Jost entered the gymnasium at Brunswick, supporting himself during the years 1809-13 as a tutor in the family of one of the trustees of the Samsonschule; then, supported by Israel Jacobson, he entered the University of Göttingen, removing a year later to that of Berlin. He graduated in 1816, and took up the profession of teaching, refusing an offer of Jacobson, who wished him to become a preacher; for Jost believed that the task of modern Judaism lay not in any reform of the services, but rather in an improvement of education. His first charge was the Bock school, where, in accordance with the system then advocated by Jewish and Christian humanitarians, Jewish and Christian pupils were educated together. The reactionary government of Prussia, however, in 1819, prohibited the reception of Christian children; this severely injured the school, as a great many Jewish parents had sent their children to it solely because they desired them to come into contact with Christians. Nevertheless, Jost remained at his post until 1835, when he was called to Frankfort-on-the-Main as teacher in the "Philanthropin," which position he held up to his death. Having himself suffered from the lack of system that characterized the yeshibah, Jost took the greatest interest in pedagogics, and his earliest literary work was devoted to the writing of text-books, amongwhich may be mentioned a grammar of the English language ("Lehrbuch der Englischen Sprache"), which went through three editions (Berlin, 1826, 1832, and 1843), and a dictionary to Shakespeare's plays (Berlin, 1830). He wrote also "Theoretisch-Praktisches Handbuch zum Unterricht im Deutschen Stil" (Berlin, 1835; the title of the 2d ed. being "Lehrbuch des Hochdeutschen Ausdruckes in Wort und Schrift," 1852). To the same class belongs his Biblical history, "Neue Jugendbibel, Enthaltend die Religiösen und Geschichtlichen Urkunden der Hebräer, mit Sorgfältiger Auswahl für die Jugend Uebersetzt und Erläutert: Erster Theil, die Fünf Bücher Mosis" (Berlin, 1823). In spite of his duties as a teacher and of his varied interests Jost never neglected Jewish literature, especially Jewish history. His first work in this line was the "Gesch. der Israeliten Seit der Zeit der Makkabäer bis auf Unsere Tage" (9 vols., Berlin, 1820-28), which was followed by a small compendium under the title "Gesch. des Israelitischen Volkes . . . für Wissenschaftlich-Gebildete Leser" (2 vols., Berlin, 1832). The work, which ended with the Napoleonic era, was continued in his "Neuere Gesch. 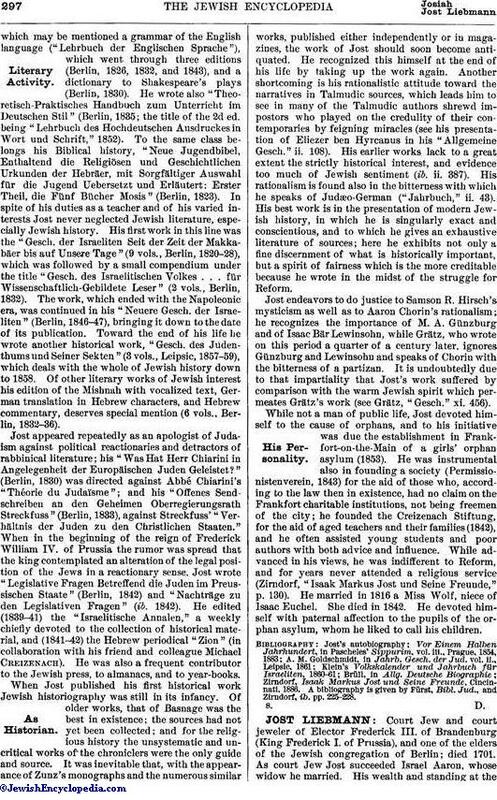 der Israeliten" (Berlin, 1846-47), bringing it down to the date of its publication. Toward the end of his life he wrote another historical work, "Gesch. des Judenthums und Seiner Sekten" (3 vols., Leipsic, 1857-59), which deals with the whole of Jewish history down to 1858. Of other literary works of Jewish interest his edition of the Mishnah with vocalized text, German translation in Hebrew characters, and Hebrew commentary, deserves special mention (6 vols., Berlin, 1832-36). Jost appeared repeatedly as an apologist of Judaism against political reactionaries and detractors of rabbinical literature; his "Was Hat Herr Chiarini in Angelegenheit der Europäischen Juden Geleistet?" (Berlin, 1830) was directed against Abbé Chiarini's "Théorie du Judaïsme"; and his "Offenes Sendschreiben an den Geheimen Oberregierungsrath Streckfuss" (Berlin, 1833), against Streckfuss' "Verhältnis der Juden zu den Christlichen Staaten." When in the beginning of the reign of Frederick William IV. of Prussia the rumor was spread that the king contemplated an alteration of the legal position of the Jews in a reactionary sense, Jost wrote "Legislative Fragen Betreffend die Juden im Preussischen Staate" (Berlin, 1842) and "Nachträge zu den Legislativen Fragen" (ib. 1842). 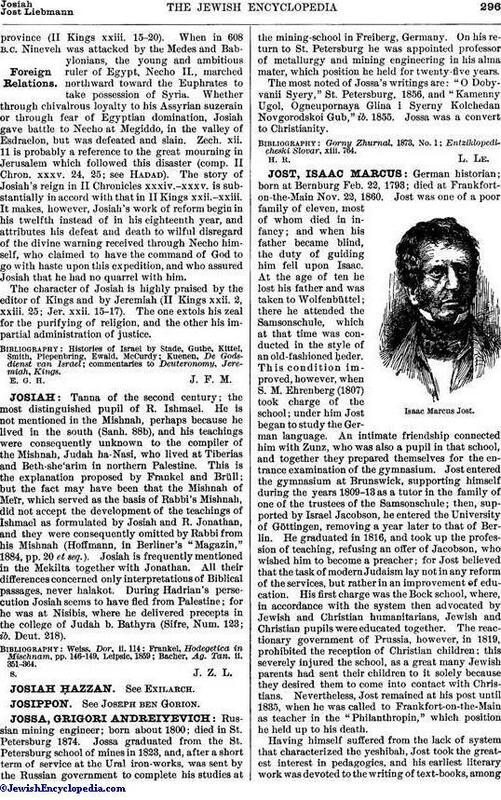 He edited (1839-41) the "Israelitische Annalen," a weekly chiefly devoted to the collection of historical material, and (1841-42) the Hebrew periodical "Zion" (in collaboration with his friend and colleague Michael Creizenach). He was also a frequent contributor to the Jewish press, to almanacs, and to year-books. When Jost published his first historical work Jewish historiography was still in its infancy. Of older works, that of Basnage was the best in existence; the sources had not yet been collected; and for the religious history the unsystematic and uncritical works of the chroniclers were the only guide and source. It was inevitable that, with the appearance of Zunz's monographs and the numerous similar works, published either independently or in magazines, the work of Jost should soon become antiquated. He recognized this himself at the end of his life by taking up the work again. Another shortcoming is his rationalistic attitude toward the narratives in Talmudic sources, which leads him to see in many of the Talmudic authors shrewd impostors who played on the credulity of their contemporaries by feigning miracles (see his presentation of Eliezer ben Hyrcanus in his "Allgemeine Gesch." ii. 108). His earlier works lack to a great extent the strictly historical interest, and evidence too much of Jewish sentiment (ib. ii. 387). His rationalism is found also in the bitterness with which he speaks of Judæo-German ("Jahrbuch," ii. 43). His best work is in the presentation of modern Jewish history, in which he is singularly exact and conscientious, and to which he gives an exhaustive literature of sources; here he exhibits not only a fine discernment of what is historically important, but a spirit of fairness which is the more creditable because he wrote in the midst of the struggle for Reform. Jost endeavors to do justice to Samson R. Hirsch's mysticism as well as to Aaron Chorin's rationalism; he recognizes the importance of M. A. Günzburg and of Isaac Bär Lewinsohn, while Grätz, who wrote on this period a quarter of a century later, ignores Günzburg and Lewinsohn and speaks of Chorin with the bitterness of a partizan. It is undoubtedly due to that impartiality that Jost's work suffered by comparison with the warm Jewish spirit which permeates Grätz's work (see Grätz, "Gesch." xi. 456). While not a man of public life, Jost devoted himself to the cause of orphans, and to his initiative was due the establishment in Frankfort-on-the-Main of a girls' orphan asylum (1853). He was instrumental also in founding a society (Permissionistenverein, 1843) for the aid of those who, according to the law then in existence, had no claim on the Frankfort charitable institutions, not being freemen of the city; he founded the Creizenach Stiftung, for the aid of aged teachers and their families (1842), and he often assisted young students and poor authors with both advice and influence. While advanced in his views, he was indifferent to Reform, and for years never attended a religious service (Zirndorf, "Isaak Markus Jost und Seine Freunde," p. 130). He married in 1816 a Miss Wolf, niece of Isaac Euchel. She died in 1842. He devoted himself with paternal affection to the pupils of the orphan asylum, whom he liked to call his children. Zirndorf, Isaak Markus Jost und Seine Freunde, Cincinnati, 1886. A bibliography is given by Fürst, Bibl. Jud., and Zirndorf, ib. pp. 225-228.